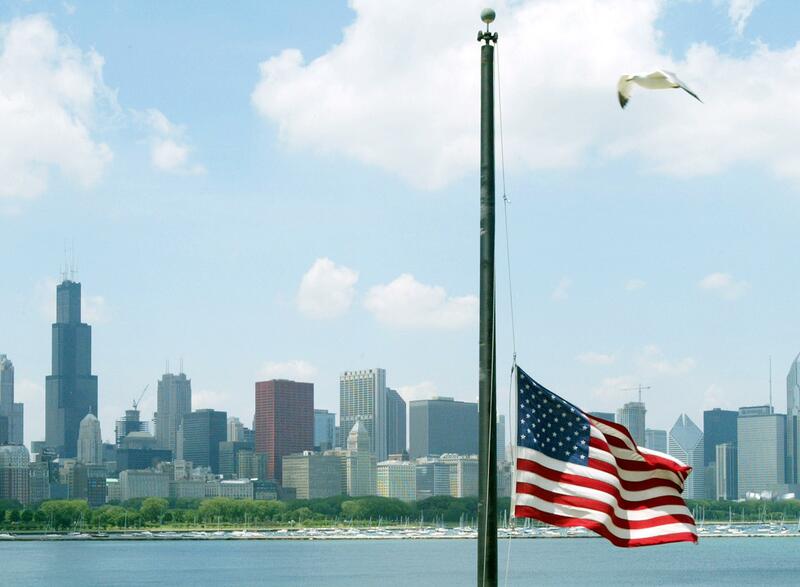 A bird flies past a U.S. flag flying at half-staff for former U.S. President Ronald Reagan along Lake Michigan June 8, 2004 in Chicago, Illinois. This Daily Mail report on a burgeoning rumor—credited to a “Daily Mail reporter”—is ready-made for virality. Ronald Reagan once lived in Hyde Park. The University of Chicago, which may one day get the Obama library, has “purchased the apartment building and they have announced plans to raze it and make it a parking lot.” We don’t get much of an idea of whether it can be stopped (it can), but we do get the appearance of a plot. Some have said that the liberal Chicago establishment does not want a reminder that Reagan, a conservative icon, once lived in the city. Its current mayor, Rahm Emmanuel, was the White House Chief of Staff during Obama’s first term. That quote comes off as serious mustache-twirling, Bond villain stuff. But it was given to the Chicago Sun-Times, not the Mail. The local paper’s context is entirely different. Hyde Park Historical Society board member Jack Spicer, also the president of all-volunteer Preservation Chicago, said the Reagan six-flat — just a mile south of President Obama’s Kenwood home — is the finest remaining example of what was once a solid working and middle-class black neighborhood. Destroying it would create “a medical canyon” that separates the hospital from the city and risks deepening long-standing wounds in university-resident relations, he said. “Whatever you think of Reagan — once the building’s gone, it’s gone forever,” he added. Always exercise caution when the phrase “some have said” materializes.